I routinely check the product pages for the not-yet-released sequels to the series I love. I’m always pleasantly surprised when I stumble across a new Chelsea Cain book in the library, featuring serial killer Gretchen Lowell and her tortured prey Archie Sheridan. And I make sure to pick up the new Sue Grafton novel when it’s released each year, although she’s running out of letters of the alphabet, and I’m getting nervous contemplating life without new Kinsey tales. But it’s the sci fi/fantasy books that keep me checking release dates to be sure one of them hasn’t snuck past me or been moved up by a merciful publishing house. If I’m lucky, a plot synopsis will have been added since the last time I checked, or there’s been some chatter in the discussion threads at the bottom of the page with speculation about upcoming storylines. I attribute my eagerness for any scrap of news on these upcoming books to the nature of serialized storytelling in science fiction and fantasy. Almost all of the books on my list left their heroes and heroines (and anti-heroes and anti-heroines) in various states of peril and unresolved plots. Nobody crafts a cliffhanger like a skilled sci fi/fantasy author -- and nobody waits as patiently for storylines to be resolved as sci fi/fantasy readers. So I stalked the Amazon page for Suzanne Collins’ Mockingjay, eager for the conclusion of Katniss Everdeen’s story. And I frequently checked up on the release dates for Terry Pratchett’s next Tiffany Aching book, I Shall Wear Midnight. I snatched them both up upon their release. 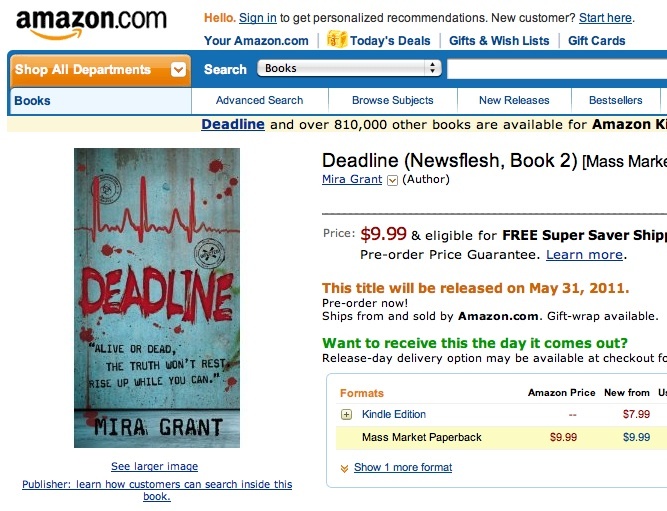 The book I’m stalking most frequently now is Deadline, the second book in Mira Grant’s Newsflesh trilogy. 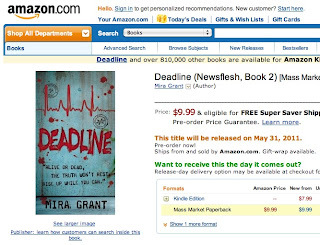 The first book, Feed, was a gripping mash-up of zombies and blogging. (Zlogging, if you will.) Grant created a fully realized world where rules, social norms and futuristic tech let society keep churning while zombies roam the streets (and the national parks), and I’m chomping at the bit for the next book to drop me back into that world. Deadline will be released on May 31, but that doesn’t stop me from swinging by the page now and then, just to look at the cover, then look at the calendar, and sigh. Sometimes, this practice leads to bad news. I’ve been keeping an eye on Ghost Story, the next book in the Dresden Files series. Like most readers, I screeched when I finished the last page of the previous book and immediately started counting the days until the next one came out, so large was the metaphorical cliff from which author Jim Butcher left his main character dangling. Its release date had been set for April 5, but – horrors! – a recent cruise by its Amazon page shows that the date has been pushed back to July 26. July 26! And of course, there’s always the next book in J.R. Ward’s Black Dagger Brotherhood series. Juuuuuust kidding. I swore of those years ago. Phromise. How about you, S4 readers? What sequels are you impatient to have in your hands? Do you swing by their Amazon pages occasionally to maintain a connection with the material? Oh, man, a girlfriend of mine just put me onto the J.R. Ward books and they're like crack. I read them all, twice, in the space of about a month. I'm eagerly awaiting Grave Dance by Kalayna Price. Her first book, Grave Witch, was sheer excellence. Fae, witches, mystery, evil deeds by evildoers - wonderful. Grave Witch? I have it on my bedside table just waiting for me to finish A Discovery of Witches. Oh, J.R. Ward! So bad for you, but so hard to stop reading. The dialogue amongst the brotherhood is the most hilarious faux-tough guy poseur stuff ever. I'm going to have to look up the Grave Witch books, too. Seriously, I could read a blog of just book recommendations. Moxie, how is A Discovery of Witches? I'm waiting for it to come in at the library, but I'm a wee bit vampired out these days.